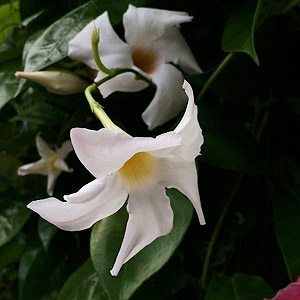 The showy flowers of Mandevilla (Chilean jasmine) make it a great climbing plant on a trellis or even in a hanging basket in frost free areas. Originating from South America, they are heavily scented, for proper care they require a well drained soil and a frost free position. Mandevilla ‘Alice du Pont’ is a popular cultivar. M. sanderi ‘Red Riding Hood’ is a cultivar sometimes known as Brazilian Jasmine and has red flowers with a yellow centre. An excellent climbing plant this is a good choice for growing in a container in a sunny position. Brilliant flowers from white through pinks and reds it is no secret that these are easy care plants. 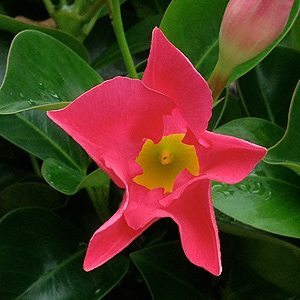 Most of the plants we see for sale are hybrids using Dipladenia and Mandevilla, these are better flowering and better behaved than the species. Mandevilla or ‘Dipladenia’ vines and plants flower from late spring through to autumn. They do best in a frost free position and can be grown in pots on a patio or balcony. They are a plant that love warmth and sunshine although some filtered shade during the hottest part of the day will provide protection from sun damage. In cooler climates Mandevilla will die right back during winter to re grow in spring. A climbing frame is best to provide some support. Although regarded as evergreen they will be deciduous in colder climates. In warmer areas prune back during winter to maintain shape. In most areas of Australia they can be grown outdoors without needing protection in winter. In the colder areas protection form frost will be required. As they are a climbing plant they will require some support, as a container grown plant, install a wire frame or similar before planting. In a container you will need to fertilize regularly, every 2 – 3 weeks from spring to autumn. Over time these climbers can get fairly large, regular pruning is required. Best pruned lightly in late winter to early spring, and try to prune lightly for best flower production. If you are growing these plants in a container and need to maintain a compact shape, prune hard in late summer to early autumn. Older plants can have growth cut back to 5 buds from the main stem to regenerate the plants. In colder areas they will be part deciduous, they may drop up to 60% of the foliage in winter. Aphids, spider Mites and Mealy Bugs can all be a problem, generally a pyrethrum spray will be the easiest solution. Over watering in winter can cause the root system to rot, so ensure that drainage is good and cut back on water. Many named varieties are available for sale, some of the popular varieties are listed below. Mandevilla x amabilis ‘Alice du pont‘ with attractive pink flowers. The common pink flowering variety is also very popular and hardy.